Overtime, carpets will become dirty, dingy and stained. Adults, pets and children are all responsible for spills, splatters and accidents that cause your carpet to need a thorough cleaning. Steam cleaners are a popular option for cleaning carpets. As it is not always feasible to purchase or rent a steam cleaner, you can successfully clean and remove dirt and stains from your carpets with a few household items and a little elbow grease. 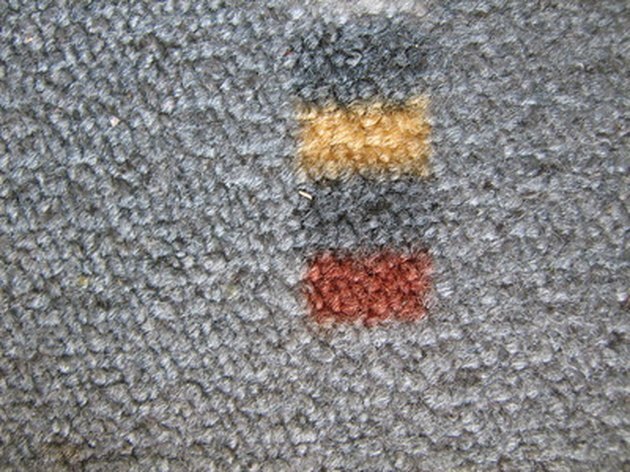 Dirt and mud can become trapped and ground into the fibers of the carpet. Remove all furniture off the carpet. Vacuum the carpet to remove any surface dirt or debris. Fill a 5-gallon bucket with 1 pint of warm water. Pour 1 tbsp. of distilled white vinegar into the bucket. Add 1/4 cup of a powdered laundry detergent to the water. Whip the contents in the bucket together with a whisk until a stiff foam forms. Saturate a scrub brush in the foam. Scrub the carpet with the brush. Start at one corner of the carpet and work your way to the other corner. Re-saturate the scrub brush when needed. Continue scrubbing in a circular motion working the foam into the fabric of the carpet. Allow the carpet to dry. Point fans towards the carpet to aid in the drying process. Vacuum the carpet to remove the residue left behind from the foam.